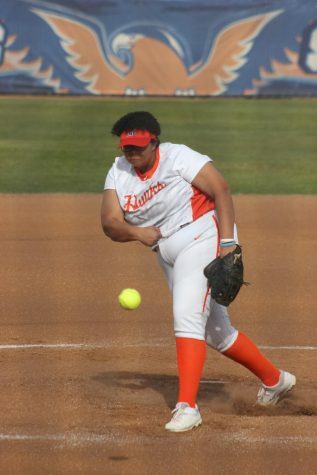 The Cosumnes River College softball team continued their strong start to the postseason on Sunday, taking game two in the best-of-three series against Feather River College with a six-inning shutout by pitcher Angelica Dark. With the 8-0 win, the Hawks advance to the super regionals. 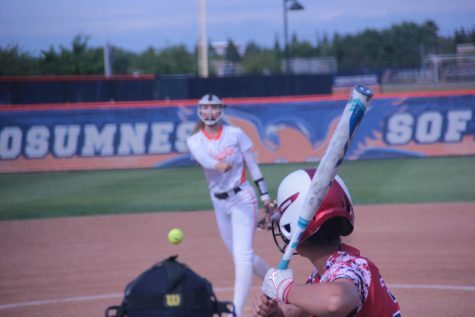 Cosumnes River struck early on Sunday, hitting first as the road team and opening up the scoring with five runs in the first inning. “I like the way we put the runs on them in the get-go. 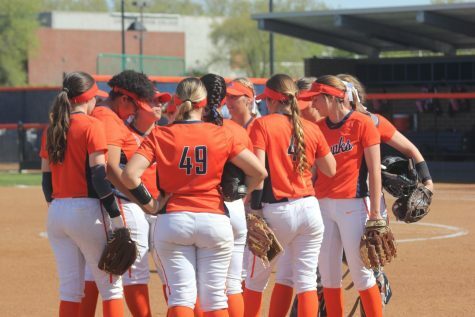 It was with the line drives, bunts, moving people around,” said head coach Kristy Schroeder. Third baseman Kacey Lutz set the tone with an RBI double that scored center fielder Amber Wright and advanced shortstop Kaitlin Pires to third base. Following an error by Feather River that allowed Pires to score, right fielder Daniel Medina drove in Lutz on an RBI single to give Cosumnes River a 3-0 lead. After an RBI single by left fielder Lindsay Lambert drove in first baseman Rachel Hooper, Feather River made a pitching change. Another error extended the inning and allowed Medina to score, giving the Hawks a 5-0 lead before Dark took the mound. Given a five-run lead when she stepped off the mound, Dark still pitched with the mindset of it being a close game. “I just treated it like a one-run game, making sure to not make any mistakes and knowing I had a great defense behind me,” Dark said. 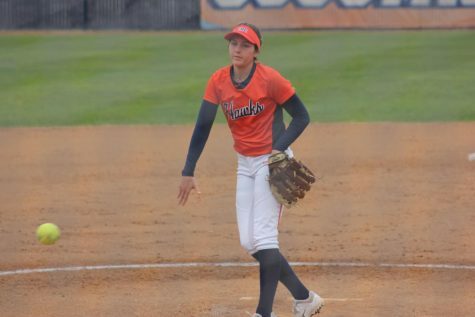 Though the Hawks didn’t score again until the sixth inning, Dark protected the team’s lead with a solid performance and strong defense behind her. 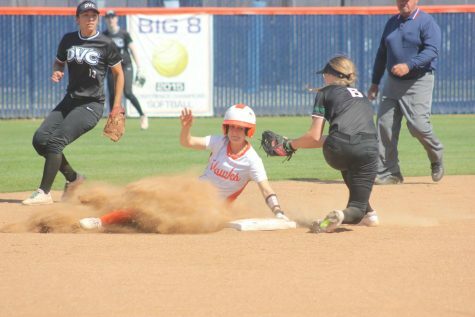 One of the biggest defensive plays of the game came in the sixth inning, when Feather River third baseman Kaitlyn Folkers lined a ball through the infield, only to have Hawks’ second baseman Alex Scardina make a diving catch to take away the hit. Eye-catching plays from multiple players highlighted the Hawks’ defense. Lambert made a running catch in deep left field to take away an extra-base hit, while Pires showed off a strong arm at shortstop. “Great defense and good pitching wins you ball games and that’s huge and for us to be playing that focused at this time, that’s huge,” Schroder said. Lutz came through again for the Hawks in the top of the sixth, delivering an RBI double to score Wright and Pires, giving Cosumnes River a 7-0 lead. Hooper followed up with an RBI single to score Lutz, giving the Hawks an 8-0 lead and putting the mercy rule into effect. 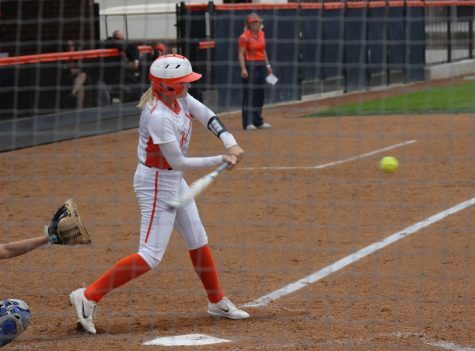 Lutz played a significant role in the team’s series-clinching victory, finishing 2-for-2 at the plate with three RBI’s, two runs scored, two walks and a stolen base, in addition to strong defense at third base. The Hawks walked away with the series win in part due to their aggressiveness on the base paths against Feather River, but on Sunday’s game the team also showed a bit of overaggressive batting. 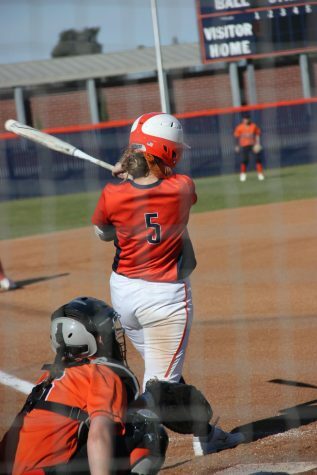 In the fifth inning, Wright tried to turn a single to centerfield into a double and was thrown out easily, while outfielder Michaela Robertson was thrown out trying to steal third in the sixth inning. The team will now head to College of San Mateo for the super regionals on May 13, where they will play a one-game playoff against Sierra College at 4 p.m. The Hawks faced Sierra College three times during the regular season, including their last two regular season home games, losing the regular-season series two games to one.